I have just submitted my VCDX application for June defense in Frimley, UK. 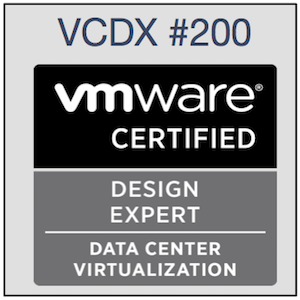 I assume all my readers know what VCDX stands for. For those who don't look at VCDX.vmware.com for further details. 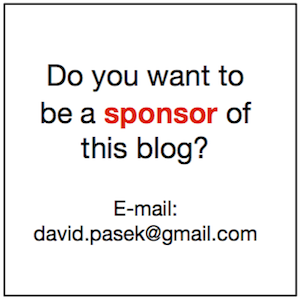 I don't want to write about VCDX defense process, preparation, etc. because there are lot of other blog posts and resources available on the internet. I think that VCDX is about continuous lifelong learning at home and practicing in the field. However I believe that learning must be significantly boosted before the defense because in VCDX panel are sitting the most skilled vSphere architects on this planet. Therefore your success probability increases when you are prepared for any question regarding your design. Preparing together is better. That's the reason I'm looking for other VCDX candidates already submitted VCDX applications and targeting July defense. I would be more then happy to organize study sessions or mock defenses over the webex. Below are session times best suiting me. However, if you prefer another time just write a comment or send a tweet to @david_pasek and I can arrange another sessions. All times are in Central European Time (GMT+2). If you want to register send a tweet to @david_pasek or post a comment with date(s) you are planning to attend. I came to your blog post http://blog.igics.com/2014/05/dell-force10-vlt-virtual-link-trunking.html and I am really happy that you shared this information with us. However I was wondering if you have tested a scenario with 4 S4810 with VLT configured on 2 x 2 and connected together (somewhere called mLAG). How do you continue to add VLT couples to the setup? I would be really happy if you could provide any info regarding such setup. So let’s deep dive into VLT port-channel between two Force10 VLT Domains also known as mVLT. Please note that VLT can be configured not only between two Force10 VLT domains but also between Force10 VLT domain and other multi chassis port-channel technology like for instance CISCO virtual Port Channel (vPC). However, this blog post is focused to single vendor solution mVLT on DELL S-Series Switches (previously known as Force10 S-Series). If you are not familiar with DELL Force10 VLT technology read my previous blog post where is VLT described in detail. It is really important to understand VLT before you try to understand mVLT (Multi-domain VLT). By the way mVLT is called eVLT (Enhanced VLT) in Force10 documentation so it might be little bit confusing. Anyway mVLT is nothing else then regular virtual port channel (VLT) between two VLT domains. Therefore mVLT is quite good term if you ask me. mVLT logical design is pretty straight forward. It is required to achieve stretched L2 over two datacenters without any loops. This topology is often called loop free topology and it is depicted on figure below from spanning tree (STP) point of view. However we would like to have hardware and link redundancy therefore multi chassis port-channel technology (Force10 VLT in our particular case) is used to still have simple loop free topology from spanning tree point of view but with switch unit and physical link redundancy. Force10 mVLT solution is logically depicted on figure below. Please note, that each single VLT Domain act in spanning tree as a single logical switch. DELL highly recommends using four links between VLT domains because of higher redundancy and optimal data flow. However, sometimes your are constraint with links between sites. Two links DCI is also supported design but not recommended because there is obviously lower link redundancy and therefore higher probability of communication over VLTi which adds hop and therefore latency. Two links mVLT DCI also known as square design is depicted on figure below. Even the topology is loop free and from logical view we have just one switch on each datacenter spanning tree protocol should be enabled and configured just in case of human error or VLT domain failure or split. Rapid Spanning Tree (RSTP) protocol is good enough therefore used later in physical configurations. Physical design below shows connectivity of four (2x two) Force10 S4810 switches leveraging four links for DCI port-channel (mVLT). Physical design for just two links DCI is depicted on following schema. And switch configuration snippets for four links mVLT are listed below for completeness. Two link DCI is just variation of similar configurations so you can simply reuse and slightly change four link configuration. description "mVLT - interconnect link"
description "VLTi - interconnect link"
Force10 mVLT is great technology for loop free L2 network topology. It can be leveraged for local loop free topologies inside single datacenter or as L2 extension between datacenters. However our networks are usually built to support IP traffic therefore L3 considerations has to be addressed as well. Just think about default IP gateway behavior and potential DCI potential trombone. That’s where other VLT features peer-routing and proxy-gateway come in to play and mitigate DCI trombone issue. You can see these technologies configured in VLT configurations above. But that’s another topic for another blog post. To be absolutely honest I personally don't recommend L2 interconnects between datacenters without any good justification. I strongly recommend L3 datacenter interconnects and when stretched L2 is needed then some network overlay technology can be leveraged. L3 will guarantee independent availability zones and splitting L2 failure domain. But on the other hand such network overlay needs some other bits and pieces which in some cases increase complexity and cost. Therefore mVLT can be seriously considered for cost effective datacenter L2 extensions. That's a typical "it depends" scenario where these two design decision options has to be compared and final decision clearly justified. If you want to know more about these technologies or use cases just ask and we can go deeper or broader. And as always any feedback and/or comment is highly appreciated. Well known VMware's storage evangelist Cormac Hogan wrote and published another VMware VSAN related document. Well, it is the book having almost 300 pages. And the nice thing is that this document/book/manual is publicly available for free. VMware’s Virtual SAN is designed to be simple: simple to configure, and simple to operate. This simplicity masks a sophisticated and powerful storage product. The purpose of this document is to fully illustrate how Virtual SAN works behind the scenes: whether this is needed in the context of problem solving, or just to more fully understand its inner workings. So if you want to know VSAN details for diagnosis and troubleshooting you have to read it.